Farming is easy, right? W-R-O-N-G! 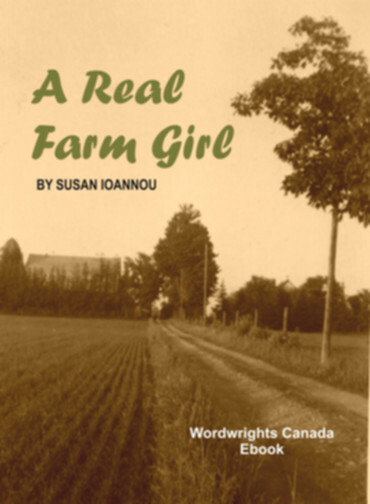 In A Real Farm Girl, author Susan Ioannou tells the story of a young city girl's adventures while visiting her grandmother's farm in the 1940s. Mary wants to prove that she can handle farm chores. She helps her Uncle Louis collect eggs from the chicken coop, milk the cows, and feed the pigs. The chores are not as easy as she thought. She gets pecked by the chickens, is chased by a bull, and has a manure mishap. But she doesn't give up. Parents and kids will enjoy Mary's antics and her determination to become a real farm girl. A Real Farm Girl was written for children ages 8-10 to enjoy, but also to learn about Canada's rural past. How did it feel to work and play in a time before surfing the Web and video games were invented? Were children then the same or different? What made them happy or sad? By giving each character a unique voice, and building scenes with vivid settings and action, Susan Ioannou has brought an earlier era to life. "It's just like a movie inside my head," said one young fan. A Real Farm Girl can be read as a continuing story, or in single episodes. Each chapter is long enough for a parent, teacher, or librarian to share out loud, and short enough for an eager young reader to tackle alone. and meet Uncle Louis and Grandma. Mary meets bedridden Uncle Johnny. Why Uncle Johnny is a "half brother". Mary confronts the chickens for eggs. Mary learns about newborn animals. Strange cousins arrive for noon dinner. Mary gets a scary surprise on washday. Mary tries to help Uncle Louis feed the pigs. Mary and Grandma shake as the sky lights up. Mary learns the hard way. Mary struggles to milk a cow. Mary spots the orange cat again. Mary flees from danger across the field. Mary learns an important lesson. After Grandma's visitors have finished their Sunday noon dinner, young Joe and Mary dash off together to play inside the barn. Standing beside the tall hay lofts, Joe dares Mary to prove she's tough enough for life on the farm. Mary replies . . .
"I'm no city girl," I bragged. "I do lots of farm work. In fact, Uncle Louis says I'll make a good farmer when I grow up." "You mean, a farmer's wife," he sneered. "No, a farmer." My cheeks burned. "A farmer, eh? You're going to drive a tractor and bring in the harvest all by yourself?" "I am!" I folded my arms. I didn't want him to know Grandma warned me away from the tractor. Last year during harvest, she told me, the Wilker boy slipped off his dad's. The back wheel crushed the boy flat. It even left tread marks across his head. "I suppose you'll load those big lofts with hay, too all by yourself," Joe went on. "Yes!" I stuck my nose in the air. "So . . ." He grinned. He looked toward the ceiling high above, where the pigeons roosted and cooed. "You're not a city girl, afraid of climbing up high?" "Then jump!" he cackled. "Jump from the high beam into the hay! I dare you!" My fists tightened into hard lumps. He tricked me! That Joetwisting and holding his sides, as he snorted that noisy boy's laughhe tricked me! And with a dare too! The high beam scared me stiff. I wouldn't even jump with Uncle Louis there to catch me. But no boy ever beat me on a dare! I thought of my dad far away in the army. Mama said he was very brave, fighting for our country. I could be brave too. I pulled in a deep breath. "Okay." I stepped forward. "I'll do it." "I bet!" He hooted louder. Cheeks flaming, I stomped to the loft wall where the ladder began. I looked up and started counting the rungs. In the dim light, I couldn't even see to the top. "Go ahead, farmer!" he yelled. I tightened my grip, and raised my foot to the first rung. Maybe if I climbed really slow, he'd get tired watching, or if I went up a little way, he'd believe me and call off the dare. "Why you going so slow, city girl?" he jeered. My ears burned! I'd show him! Susan Ioannou is known across Canada as a poet, fiction writer, and literary essayist for adults. 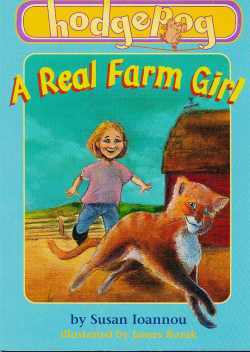 A Real Farm Girl is one of her two children's novels. Previously, her stories and poems for young people have appeared in such publications as BC Reading Assessment, Canadian Children's Annual, Chickadee, Cricket, Nelson Canada's Flip Flops and Listening and How, Pockets, and Read-Aloud Poems. She is also the author/publisher of Polly's Punctuation Primer and the boys' adventure The Hidden Valley Mystery. Paperback, illustrated by James Rozak (Edmonton: Hodgepog Books, 1998), 123 pages, ISBN 978-1-895836-52-3.
eBook, expanded all-text edition (Wordwrights Canada, 2010), eISBN 978-0-920835-33-3. Autographed Paperback, $5.99, contact susanio[at]sympatico.ca.